It may come as a surprise to you, but the One who created the universe once lived here on this earth as a man. 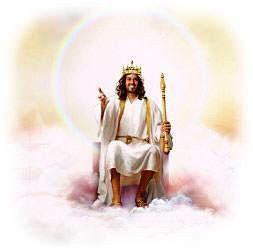 This One is none other than the Lord Jesus Christ, the Son of God. God wants us to believe on His Son and to receive Him as our Saviour. In order that we might know who Jesus is and what He did, God has given us four accounts of the life of His Son. 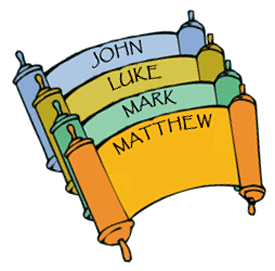 These books in the Bible are called "the gospels," and they are named after the four men whom God chose to write them—Matthew, Mark, Luke, and John. Hundreds of years before the Lord Jesus came into the world, His birth was foretold in the Bible. 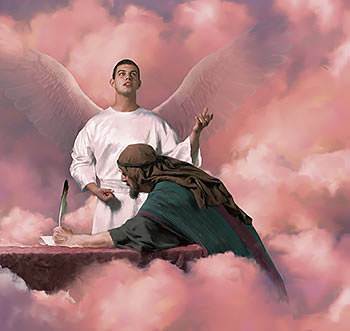 "Foretold" means that men of God told what was going to happen long before it happened. "the Word was made flesh...."
"Immanuel" means "God with us." This Child, who was promised by God, would not be an ordinary child; He would be God coming to be with us. Also, this Child would be born of a virgin; that is, He would be born of a pure, unmarried woman. He would be conceived by the Holy Spirit. The Jewish people called this promised Saviour "the Messiah." In the Greek language, He is called "the Christ." 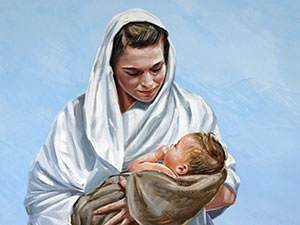 The Bible foretold exactly where the Messiah would be born. The prophet Micah wrote that He would be born in Bethlehem. 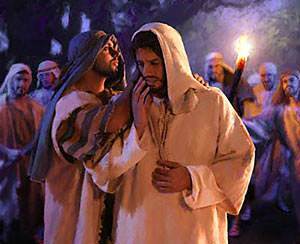 When Jesus was just a tiny baby, Joseph and Mary took Him to the temple. 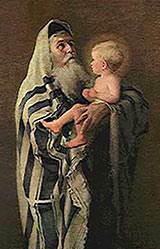 At the temple there was a holy man of God named Simeon. 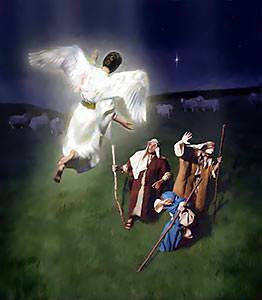 God had revealed to Simeon that, before he died, he would see the promised Saviour. What do these verses tell us? They tell us that our salvation is a person. The Lord Jesus Christ Himself is our salvation. 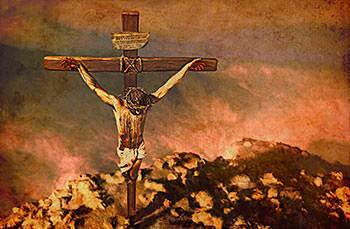 Is Jesus really "the Christ," the promised Saviour? Yes, He is! How do we know? We know because the Bible says so. The Bible declares plainly that Jesus is the Christ. 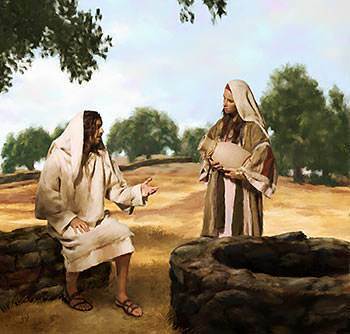 In John chapter 4, we have the account of Jesus talking with the woman at the well. The woman thought that Jesus was a prophet. She said to Him, "I know that Messiah comes, which is called Christ: when He is come, He will tell us all things." Jesus said to her, "I who speak to you am He." Later on, when Jesus asked His disciples, "Whom do you say that I am?" Simon Peter said, "You are the Christ, the Son of the living God." Now let us look at God's Word and see how Jesus has fulfilled the prophecies concerning the promised Saviour. These prophecies were written many hundreds of years before Christ was born. Micah 5:2 "But thou, Bethlehem Ephratah, though thou be little among the thousands of Judah, yet out of thee shall He come forth unto Me that is to be ruler in Israel; whose goings forth have been from of old, from everlasting." 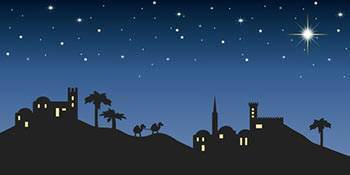 Matthew 2:1 "...Jesus was born in Bethlehem of Judea in the days of Herod the king..."
Isaiah 7:14 "Therefore the Lord Himself shall give you a sign; Behold, a virgin shall conceive, and bear a son, and shall call His name Immanuel." Matthew 1:18 "Now the birth of Jesus Christ was on this wise: When as His mother Mary was espoused to Joseph, before they came together, she was found with child of the Holy Ghost." 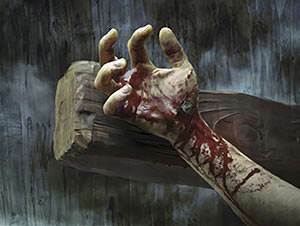 Psalm 22:16 "...they pierced My hands and My feet." 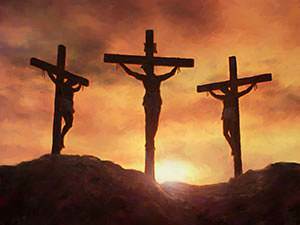 Luke 23:33 "And when they were come to the place, which is called Calvary, there they crucified Him..."
1 Peter 2:24 "Who His own self bare our sins in His own body on the tree..."
Psalm 22:1 "My God, my God, why hast Thou forsaken me? Why art Thou so far from helping me...?" 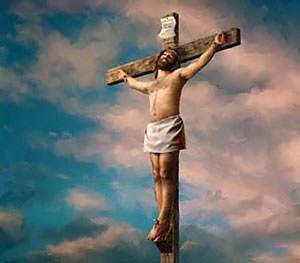 Matthew 27:46 "And about the ninth hour Jesus cried with a loud voice, saying…My God, My God, why hast Thou forsaken Me?" Mark 15:24 "And when they had crucified Him, they parted His garments, casting lots upon them, what every man should take." Psalm 34:20 "He keepeth all His bones: not one of them is broken." John 19:33 "But when they came to Jesus, and saw that He was dead already, they brake not His legs." Isaiah 53:3 "He is despised and rejected of men; a man of sorrows, and acquainted with grief..."
Psalm 41:9 "Yea, Mine own familiar friend, in whom I trusted, which did eat of My bread, hath lifted up his heel against Me." 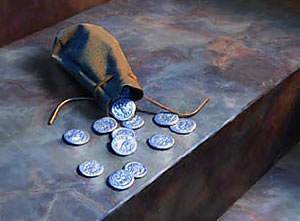 Zechariah 11:12 "...they weighed for My price thirty pieces of silver." 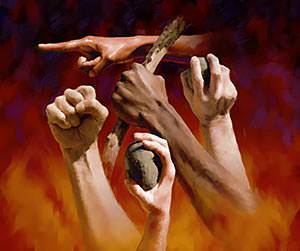 Matthew 26:14-15 "Judas Iscariot...said unto them, What will ye give me, and I will deliver Him unto you? And they covenanted with him for thirty pieces of silver." 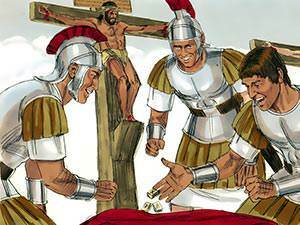 Isaiah 53:12 "...He was numbered with the transgressors; and He bare the sin of many..."
Matthew 27:38 "Then were there two thieves crucified with Him, one on the right hand, and another on the left." Matthew 28:5-6 "And the angel answered and said unto the women, Fear not ye: for I know that ye seek Jesus, which was crucified. 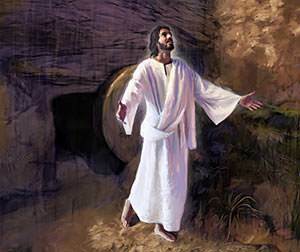 He is not here: for He is risen, as He said. 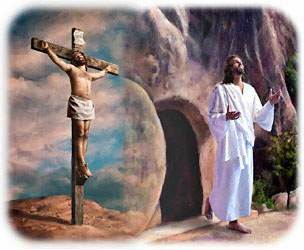 Come, see the place where the Lord lay." 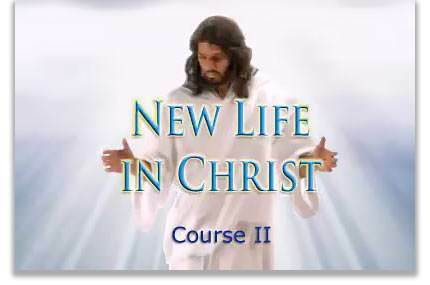 First, let us see what the name "the Lord Jesus Christ" means. Then we shall see what it means to believe on Him. This is His kingly name that stands for His rulership over all things. He is God. He has all power in Heaven and in the earth. This is His personal, human name. It means "Saviour." 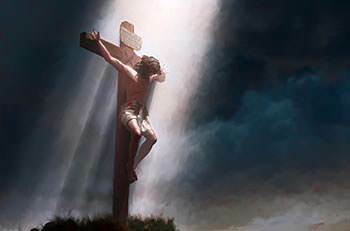 Jesus is the Saviour, the One who died for our sins and rose again from the dead. He is a living Saviour. This is His official name. It means "the anointed One." We have already seen that Jesus is "the Christ"—the promised Saviour. 3. that by believing on Him, He becomes your very own Saviour, so that what He has done is really for you. 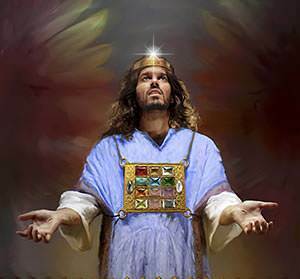 Jesus Christ is indeed the promised Saviour, but is He your Saviour? If you are not sure that you are saved, study carefully the following Scriptures. Remember, believing God means believing precisely what God says in His Word.